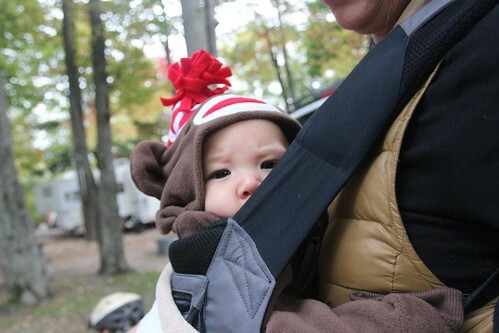 Mali Mish - Day 64: Arriving at Ludington State Park. 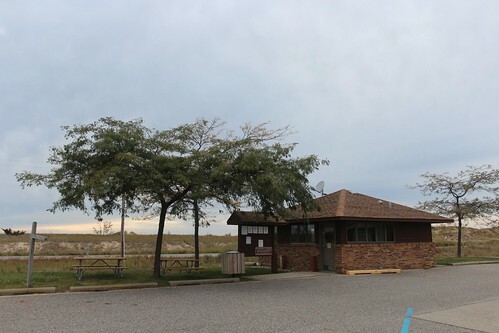 I can see how Grand Haven State Park can be really crowded during the busy season. Even though the campground is essentially a beach-side parking lot and the sites are small and tight, it is right on the water and is in a quaint and unique city for a relative bargain to locals at only $27 a night. Although when it is cold, wet and windy, it is much less appealing. 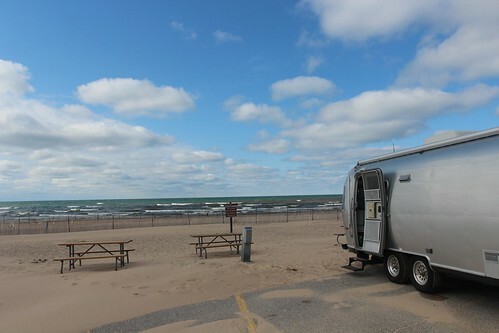 Our 2-night stop here will come to an end today, not because we wouldn’t like to stay longer but because we have a date to keep at another great state park north of here near the town of Ludington. 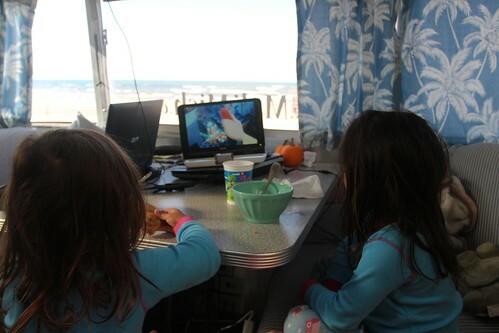 We got our usual late start with the girls eating breakfast in pajamas at the dinette table. As windy and cold as it might be outside, the view from our dinette is worth a million bucks. With our battery issues resolved, we are ready to do some serious boondocking. The patchy clouds can still be a factor for extended days of not plugging in but since we had a couple of days of 30-amp goodness, we are ready to head out. Good bye Grand Haven, we have enjoyed our time here. First stop before we leave town is to fill a prescription for our cat Yoda. 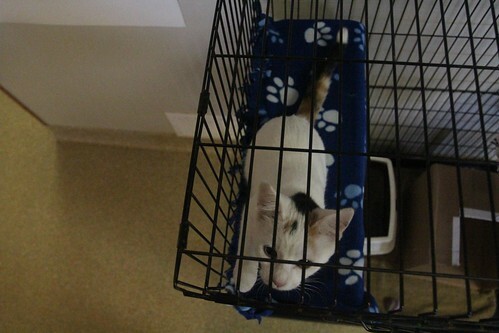 No, she is not sick, we just have her on a precautionary diet that is sold by prescription only. We had a prescription written up for her before we left and she had run out of our supply in the 2 months since we left California. The vet office had kittens up for adoption. As much as we would have liked to give this guy a nice home, we are running low on real estate. Plus Yoda would probably rip this little guy a new one. 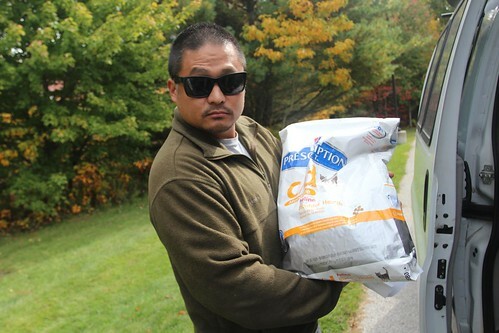 We got the biggest bag they had at 17 lbs. I hope this lasts long enough for us to get another script from the cat doc. 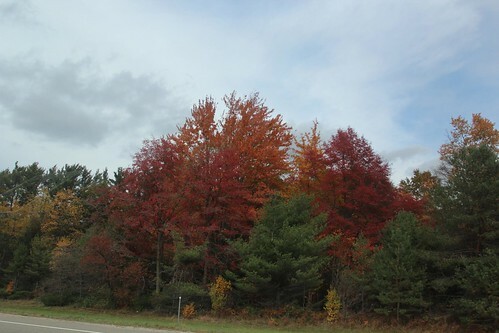 As we drove further north towards Ludington, the colors in the trees got progressively more intense. Some of the leaves are fiery red like these in the photo. Ludington State Park is a few miles north of the town of Ludington. We took a gamble and did not reserve a campsite against many people’s better judgment. When I looked into reserving the site a couple of weeks ago, we were just across the lake in Sheboygan. Because it is a weekend, the reservation system does not allow single night stays if it includes a Friday or a Saturday. There were no consecutive nights available so I would have had to book Thursday-Friday in a site and move to another for Saturday-Sunday. I figured others trying to reserve these sites might have the same dilemma so I opted to wait until we got here so I can at least scope out the campground to also make sure I had decent phone reception for work reasons. To our surprise, there were 5 sites available in our desired campground for the consecutive nights Friday-Saturday-Sunday. We had planned to stay at the nearby Walmart tonight but after a quick drive through the campground, we decided to pay for a site and not have to move for the next three days. Ludington State Park is beautiful. Even though the beach was just as windy today as Grand Haven, the campground we were at, Beechwood, was heavily wooded and sheltered from the wind. The only way you know it is blowing at the beach is by listening to the rustling of the leaves at the treetops. 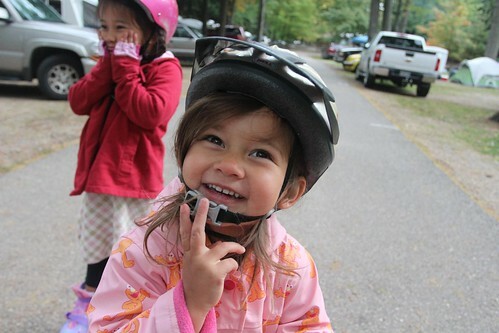 Ludington has a total of 3 campgrounds. Pines, Cedars and Beechwood. Pines is closed for upgrades for the season and between Beechwood and Cedars, Beechwood is much more spacious. It is surprisingly crowded here at Beechwood campground. It is probably the most crowded campground we have stayed at since before Labor Day. Most people here booked their sites 6 months ago and was likely the only way to guarantee a site here if your camping schedules are not flexible like ours. We are here to meet a fellow blogger Doug Trout and his family. We have been friends on facebook for over a year and when we knew we would be coming through his home state of Ohio, we contact them and arranged to meetup on our way through. They are not going to be here until tomorrow so we are very much looking forward to meeting them. They have 2 boys and a girl whose age falls right between Ava and Mila. If you have not been to his blog, check out TroutStream at airstreamweekends.blogspot.com. 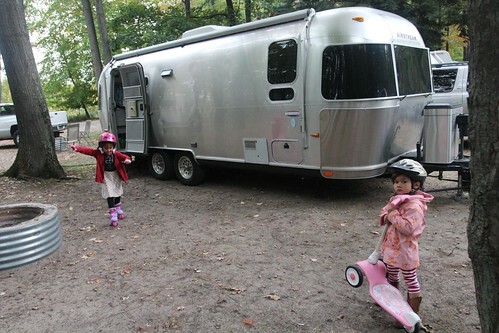 He just started blogging at the beginning of the year but has lots of great posts of their weekend visits with the Airstream covering the midwest, south and east coast. 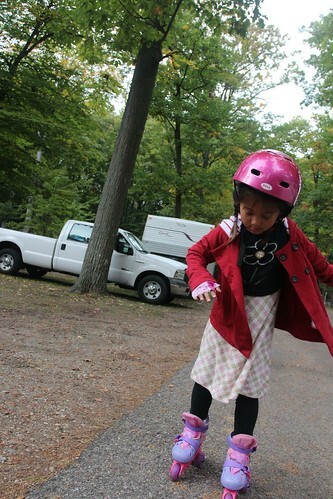 Ava has been asking when she can ride her roller skates and we have not had a chance until today. The asphalt is a bit rough but they are loving it here so far at Ludington. The weather is suppose to get a little cold but we are looking forward to the weekend. 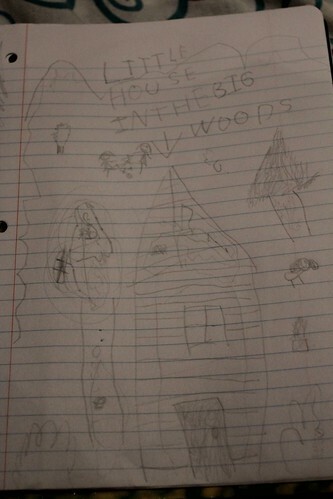 The beautiful campground in the woods inspired Ava to draw this picture depicting Laura Ingalls Little House in the Big Woods. Since our visit to De Smet, South Dakota, the girls have been very interested in the Little House stories. I got the entire series of audio books for them and we have been listening to them during our transit days. Tomorrow, we will start to do some exploring of these big woods ourselves. 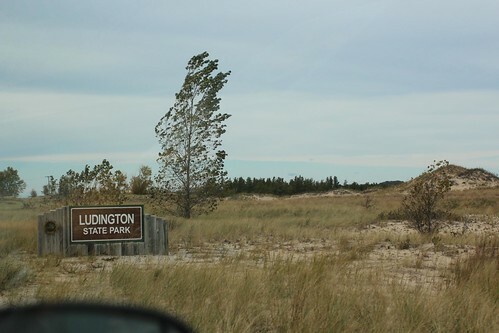 3 Responses to Day 64: Arriving at Ludington State Park. 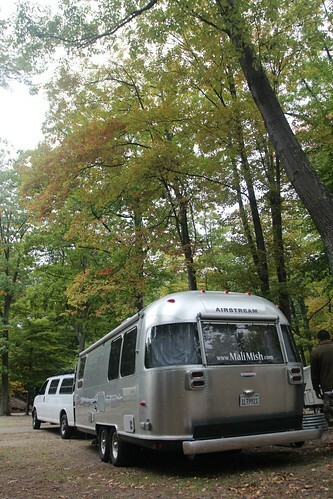 Our *favorite* Michigan State Campground. We try to get there at least once a year… yeah, reservations are a difficult. If it’s a holiday weekend, you need to be online, making reservations the minute it opens up (six months in advance). Good hiking trails… I bet they’re pretty this time of year. The ‘Lighthouse’ trail might be a little much for the girls, relatively easy, but 2-3 miles IIRC. The ‘Big Sable Point’ lighthouse is worth a stop… great views from the top, especially on a clear day. I *think* we stayed there in ’05 in our first trailer, but I had the flu so I’m not real clear on where we were, but there were sand dunes. Are there dunes? We can related to the prescription diet! I’m a Michigander who LOVES Ludington. I started going to the city beach when I was 10 – that’s 55 years ago. The state park is delightful in the summer when it’s warm enough to swim in Lake Michigan, kayak on the smaller lakes and go tubbing on the river. Like all Michigan campgrounds, it gets really crowded, but that’s how you meet and get to know nice people. Glad you enjoyed it.